All week the weather forecast had been for blue skies, but ridiculous crosswind, so I hadn’t counted any chickens on this lesson – in fact at 8:50am I was still waiting for the phone to ring. It didn’t. Upon arrival, it seemed like we were very much on – even with the briefing room windows being thrashed by the winds outside. Might be out of my limits, but not my instructors. Finally a lesson where I won’t get told this 🙂 It’s safe to say I rarely ‘believe’ the big instrument outside the window and am much happier with the gyroscopes and pressure sensors…..yes it’s wrong, yes they lag, no I can’t keep my eyes off them. I’m sure everyone has their ‘thing’ when learning, this is mine. After a year and a half you’d think I’d know the ‘Basic T’ of instruments off by heart, and yet it was amusing to find that when put on the spot I couldn’t put them in their positions…….weird – but then I can touch type, but I couldn’t tell you where all the keys are. It’s been a while but back in Romeo Charlie, you can’t go wrong with this plane, I dunno why but it always feels shiny and new. Except today it had a build up of ice on its wings. Time to become taxi driver and turn it around so its wings were facing the sun, that soon had it sorted. Other than that, looking good as always. My morning coffee hadn’t been fully absorbed yet, I was doing some strange things in the checks….. I always, always, always now inform instructors if the temperatures are not in the green, but for some reason today I just assumed it was ok for them not to be today and carried on. Of course it was picked up – I mean come on, there was ice on the wings 10 minutes ago! With the crosswind I found it doubtful I’d even do the take-off, but we formulated a plan for me to do it during the take-off brief. God you’d think this should be instinctive by now, but I must have been wearing the record out today “rudder”, “more rudder”, “don’t forget the rudder.” My other sin of the day was not lowering the nose in the climb, thus essentially meaning you’re not able to lookout and see if you’re about to climb into something else. 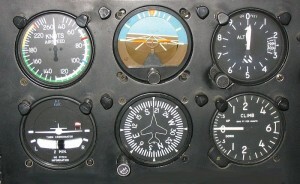 The artificial horizon and direction indicator (and in some cases, but not this one the turn coordinator) are all driven by gyroscopes – being antique technology, they’re all driven from a suction system whereby the engine drives a pump which creates a vacuum, resulting in an airflow which makes respective gyroscopes spin. There are better (and safer) ways to do it, but we won’t go there today. Best case scenario of failure then, if we lose the suction pump, we lose the artificial horizon and the direction indicator. An easy failure to simulate: they were covered up by a piece of paper. Now I’d have to fly on the compass and the big picture outside (which my instructor will tell you I hate flying on 😉 ). Other readers who are learning to fly might find this absurd, how can I be this far in and be leaving a map in my bag? I’d want to agree with you, but the reality is, in all my flight training I’ve used a map in a plane: Once and even then it was an instructor passing me his, there’s been no development of getting into a habit of having it in the side pocket because it might be needed on a lesson etc. All that turning for suction system failure, meant that initially I had no idea where I was. However, now I needed to find Bourn, a few seconds looking out of the window and suddenly my first local area solo was paying dividends. 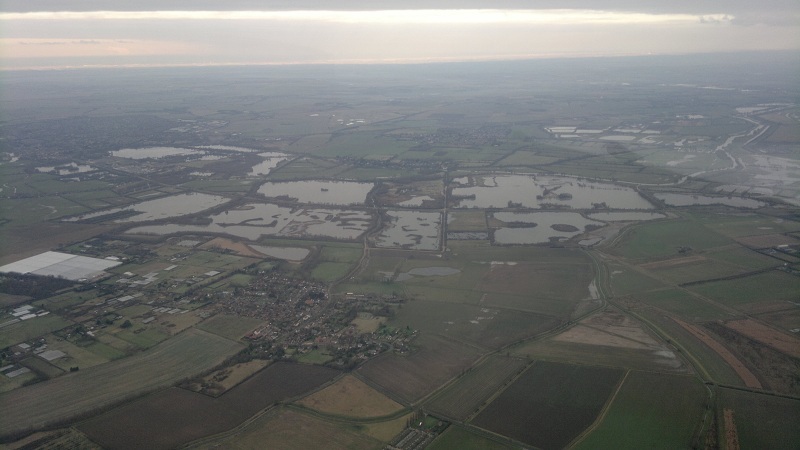 Just off to the right was the now familiar lakes just north of Fen Draydon, where a few weeks ago I’d been getting in some practice advanced turns. I knew ball park where Bourn was, but a quick look on the map suggested that it’s dead south of Fen Draydon, so all I needed to do was turn the plane 90 degrees to the left to fly south of Fen Drayton and we should find ourselves an airfield. What I hadn’t quite appreciated (though I’ve noted this before), is that because we were at 3,000ft, trigonometry tells you that your forward visibility on the ground is immense! As a result I was stunned by how quick the airfield was in sight. Phew, found it…….navigation is a weird thing, it should be quite obvious that if you point a plane at the heading for something, given some time, it will appear!! Yet it’s amazing how, almost relieved, you are when you discover this holds true. Time to see if I could fly straight and level with my eyes closed. The temptation once you do this is to move the control column, but knowing the theory that my internal balance system will go to hell upon doing this, I found myself consciously fighting the desire to move the control column and change nothing. Sure enough upon opening my eyes we were still straight and level at ~3000ft, but my god does it take some concentration and commitment to the idea that all the sensations in your head are a lie. Next it was time to do some instrument flying proper, using a set of Foggles, essentially these glasses block your view of the big instrument outside the windows and let you only look down at the instruments. The scan of the instruments changes when flying on instruments (not that you should be on a PPL). Due to the fact that the Artificial Horizon is the only instrument that tells you about pitch AND roll, this becomes the primary instrument and all scans start and end here, then only a reduced set of other instruments are focused on in the scan, depending on the maneuver. So for straight and level the sequence is: AH, ALT (Altimeter), AH, DI (Direction Indicator), AH, ALT, AH, DI, AH…..and just keep repeating this. The trick is to not stop concentrating on the scan and make small corrections. One thing I have no issue with is in trusting my instruments, so I found myself quite happy to cycle this scan and fly it straight and level with no real issues, I could have happily done that all day (or at least until the fuel got low). Next up, climb on instruments, this uses a slightly different scan but the fundamentals are the same. Followed predictably by a descent. Finally some turns, which rather than the normal 30 degrees of bank for a level turn, on instruments are done at ‘Rate 1’ – which is marked on the turn coordinator as the the white marks under the wings of the aeroplane, this equates to a turn of ~15-18 degrees. I’m no longer flying on instruments…. What I meant was “I can not see the instruments, therefore I’m not able to fly on them.” However, by the time I’d brought myself to accept that and say something, my attempts to fly straight and level into the sunshine were looking pretty shocking. So I think the statement got interpreted as “I’m doing a pretty rubbish job of this aren’t I….”, resulting in some tips on bringing it all back together. Though moments later the question of “Can you actually see the instruments?” came and we changed heading soon after 🙂 When you see stories on the news about flight crews being confused in the cockpit, this is how easy it can happen…. Once I could see the instruments again my flying returned to normal, but it made for another good point. While flying into the sun I was seeing the instruments through the glare maybe once every 5 seconds, at that response rate, the control loop was broken – I wasn’t able to react sufficiently to keep the plane flying and was essentially just losing control. Which tells you a lot about how much you need to concentrate on the instruments once outside of visual flight conditions – and why it’s not allowed on a basic license. Essentially this task involves you closing your eyes with your head down, while the instructor sets the plane up into some bonkers configuration (e.g. no power, pointing at the ground, rolling right….). I was quite happy recovering from the no power conditions, but my Achilles heel turned out to be when the power was left full on. 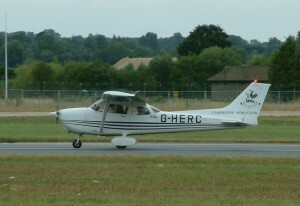 I’d recognise there being too much power and reduce it, but I wouldn’t bring it all the way back to idle, this is the trauma that Charlie Bravo has done to me, so expectant of a engine stall at idle (and yes I know I’m not even in the same plane) I can’t unconsciously just pull the power to idle. Resulting in the airspeed at times sitting at borderline yellow [caution] speed, but my tendency seemed to be to take off just enough power to keep it bordering green. There had to be something a little off today, the rest had gone quite nicely. It had felt a minor miracle we’d gone up at all, even more so I’d got to do the take off in the winds we were getting. On return to the airfield they hadn’t let up at all, in fact as we flew downwind they were at the limits for an instructor, possibly beyond. Resulting in another first. I’ve never flown Runway 28, it’s a grass runway rarely used except I guess for times like this. The thing to watch in bad winds is the ease in which you can lose airspeed, essentially wind shear, so you want to come in a little faster than normal – and I guess faced with the shorter grass runway and not wanting to overshoot, but also a flock of birds and an ATC request to not land on its numbers. I let the airspeed get a bit lower then we’d like. The landing however seemed all good (though I suspect there was a lot of help involved). Some good points made, it’s been a while since I’ve done the fundamentals, so a reminder on the climb out that I need to lower the nose and have a good look out, I can’t just point the nose for 80 knots and sit back until the altimeter reads 3,000ft 🙂 and if I’m going to descend, I can pick any speed I like, but I should know why we’re descending at that speed (e.g. I’ve decided to do a cruise descent, so we’re descending at 90 knots……fine, but don’t descend at any old rate the plane happens to give on the day etc.). Other than that, to read up on navigation because the flying bit is now essentially done and we’re into navigation proper from here on in. This entry was posted on Tuesday, February 12th, 2013 at 8:29 am by PHC	and is filed under Actual Lessons, PPL Course. You can follow any responses to this entry through the RSS 2.0 feed. You can leave a response, or trackback from your own site.